Josiah Kenpo Karate (JKK) is a studio dedicated to teaching effective self defense techniques to both children and adults on the upper east side of Manhattan. In particular, Josiah Kenpo teaches American Kenpo Karate in the style of Ed Parker (considered the founder of American Kenpo). Beyond standard techniques and methods, lessons are shaped to the abilities and needs of individual students. The studio itself is located on the upper east side of Manhattan and intends primarily to serve students in the same vicinity. Students occasionally move to other locales but return to the upper east side for continued training. With a number of gyms, activity centers, and alternative martial arts studios on the upper east side, there is a need to differentiate JKK from the crowd. It is important to note that Josiah Kenpo Karate is the only Kenpo Karate club on the upper east side of Manhattan. Further, we cater to children and young adults. And finally, we focus only on what is effective. Kenpo as a particular form of martial arts training incorporates a balanced set of hand, foot, body leveraging, and weapons techniques. Other forms of martial arts tend to specialize in one area of training (hapkido on hand techniques, tae kwon do on foot techniques, judo on body leveraging, and various on weapons). In addition, Kenpo remains pragmatic and focuses on effective and practical techniques. While rooted in tradition and history, Kenpo is open enough to embrace improvements and proven elements from other disciplines. 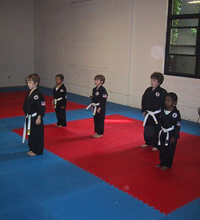 The Josiah Kenpo Karate studio incorporates these particular advantages and manages to maintain a low teacher to student ratio in a studio that operates six days per week, morning through evening. Josiah Kenpo offers practical defense techniques for adults and children, hands-on instruction, and convenient hours.